Waking up on Monday morning I all of a sudden felt a rush of memories from the Leona Divide 30K race. The high heat and carnage out on the trails led to many adventures and acts of courage and stubbornness. I must admit that once again I was physically under trained for this race and knew that my penance would be a day of suffering. You may think that this reality would have been enough reason for me to stay home that day but after dealing with stressful life stuff for the past few months my mind was calloused and tough enough to meet the challenge. That’s what life challenges do, right? They prepare you to take on tougher challenges. A couple of days before the race I heard that race day was going to be hot. 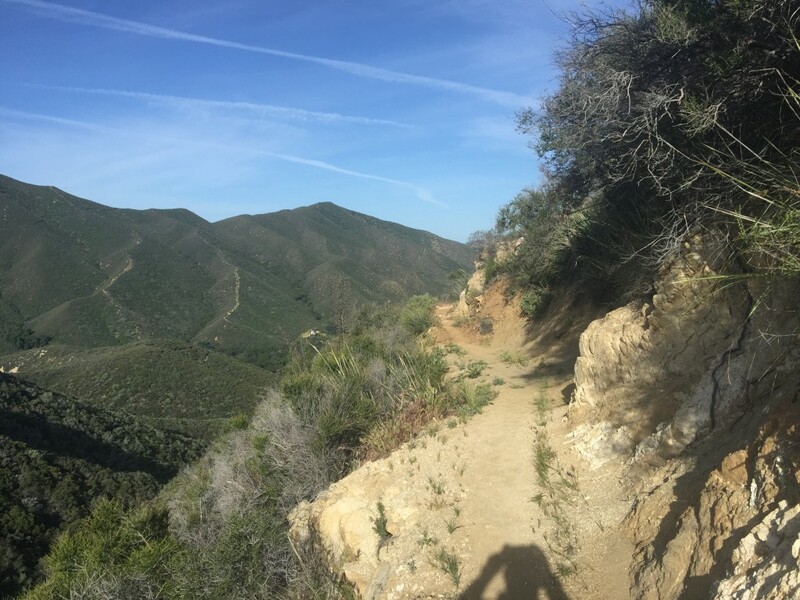 Since I mostly train along the coast in the Santa Monica Mountains I’m used to shoreline weather so heading into desert territory with some elevation amplifies the effects of hot weather and it sneaks up on you. I had a heat plan. Last year I had probably my best race ever at the Leona Divide 50K. The biggest obstacle to an even better day would have been a better hydrating strategy. I kept running out of water so that reduced me to a power hike the last couple of miles from aid stations. This year I was determined to fix that problem. I stayed up late before race day to do laundry and get all my gear set up. I had already gone to the bib pickup so I didn’t have that extra anxiety of getting there extra early. I got up, showered, fed the dogs, grabbed my pb&j from the fridge and headed out the door. I wasn’t hungry at all and didn’t drink my usual coffee. I don’t like breaking my morning routines but tried not to make a big deal about it. The drive to the race was uneventful and I nibbled on half of the pb&j and left the other half in the car. I made it to the Green Valley community center in time to see the 50 mile/50K race start. Ran into to friends and chatted for a bit before I filmed the race start. The race started a bit late because the porta potty lines were very backed up. 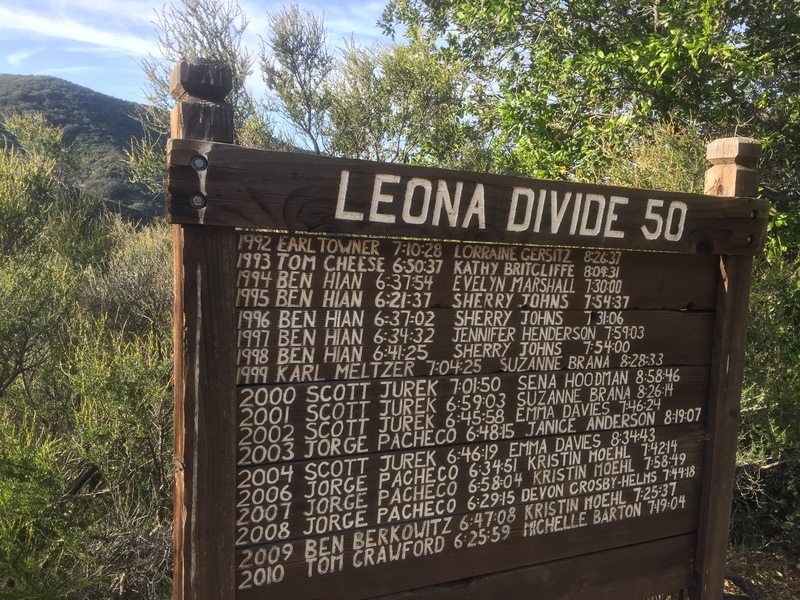 Here’s my video of the Leona Divide 50 mile and 50K start from my YouTube channel. Finally the 50 mile/50K race was underway and a few minutes later the 30K race was toeing the start line and ready to go. During the bib pickup the previous day, I had driven the first mile of the course which is all on an asphalt road. I counted the number of turns to get to the top and I counted 12 turns. I wanted to use this so that I could keep track during race morning when I started to ask “when are we going to get off this dang road?” During the race I got to turn number 7 then didn’t notice the other turns, distracted by the beautiful morning views then shifted onto the Spunky Edison trail. Leona Divide 30K Uphill Views. Part of my heat plan was to carry an extra handheld bottle, wear white sun sleeves and a white bandana that I could use to stuff in some ice if need be. I only carried half of the water during the first 3 miles since it was a short stretch and was all uphill. That would reduce the weight and I wouldn’t need that much water with a cool morning start. When I got to the Spunky Edison aid station I loaded up the two bottles but decided to still not load up the handheld bottle. 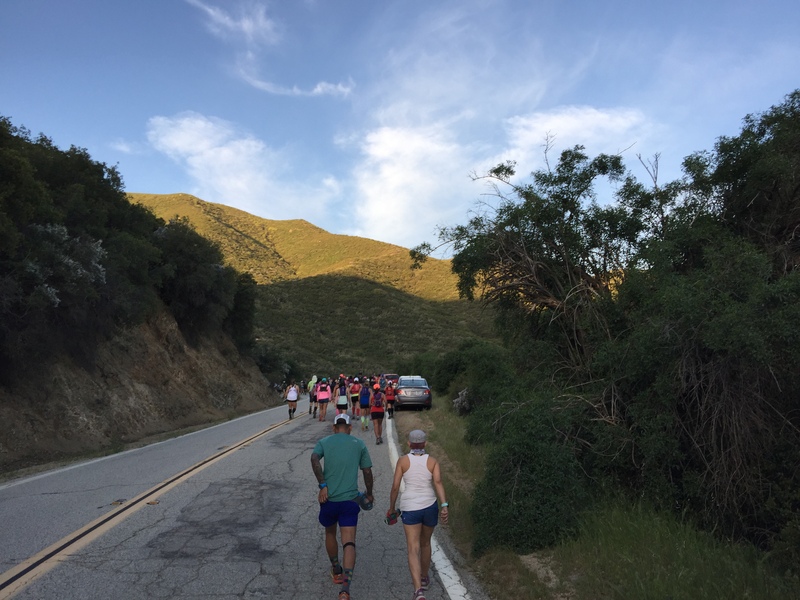 It was still relatively cool and the way out to San Francisquito was the cooler part of the race. After leaving the aid station, I ran the flats and the downhills and felt pretty good. After a mile my lack of training started to kick in so I resolved to power hike the flats as well. The next few miles clicked by and the world was good. Eventually the super fast marathoners started to come towards me on the trail and then some fast 50K runners passed me from behind. I couldn’t remember if the San Francisquito aid station was at mile 9 or 10. The last two years I ran the the 50K race so the mileage had been different. Towards the end of that stretch, I caught up to one of the zippy runners who had passed me but he had slowed down quite a bit. His body was not happy and it looked like it was starting to shut down with either cramps or just exhaustion. I gave him some salt pills and didn’t really see any water on him so gave him my water bottle which still had about 10-20 ounces of water left. I told him to drink the water and take the pills and suggested he stay on the up side of the mountain since he was walking very close to edge of the trail where there was a big drop off. Heading towards San Francisquito aid station. Amazingly when I left the runner I was only a few hundred yards from the big downhill into the aid station. I actually got there faster than I thought. This is amazing because that trail out to that aid station has been a torturous path the last couple of years. At the aid station I loaded up the handheld with ice and water, loaded up the other bottle with electrolyte but knew that my hydration plan would not include that third bottle. I didn’t want to wait for the runner to come in because that would be at least 15 minutes so I put some ice under my hat and headed off. I ran into the runner and he was still moving slow but looked happy to almost be at the aid station. He gave me the bottle back and I can tell he hadn’t really drank any of it. The climb out of the aid station is the last long climb of the entire race. I took my time but it was still a lot of work to get to the top. About 2 miles into the run back I started feeling the heat and my water supply was quickly dwindling. The wheels were falling off the wagon. My vision started getting impaired where everything was becoming super bright. 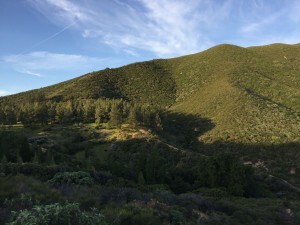 When I tried to run I would look at the trail and it would be glowing white and that would make me stumble around some which is not safe given the narrowness of that part of the Pacific Crest Trail. One wrong stumble and that that could shoot me down a 50-100 foot section of the mountain. Shorty after this span, a group of runners sped by and one of the runners was the fellow who was in bad shape earlier. It looks like he got things sorted out and was back in action and had a couple of people to run with him. My slower speeds meant more heat exposure and less water. Around that time I started shade hopping and when I found a good patch of shade to sit in, I did. A lot of runners passed me going both ways and they would ask if I was OK. I told them I was just taking a break and was fine. Some runners said that it actually looked and a good idea but decided to continue on. Shortly after my shade hopping a runner came towards me and said to watch out for a couple of rattlers that were up the trail near some bushes. Yeah, I didn’t shade hop for another mile and when I did I made sure there were no slithery fellows around. I got to the point where I started asking people for water which I didn’t want to do because I know others were also concerned with the heat. Thanks to all who shared water. Leona Divide Sign on the Pacific Crest Trail. I finally made it to the bench by the Leona Divide sign and it was divine. A big bench and beautiful shade. The only thing missing was a water spigot. I saw a runner zooming towards me and he actually stopped and sat with me. I am Facebook friends with Sergio but hadn’t met him in person before. I shared some water with Sergio and then after a couple of moments he picked up and started running again. He went on to crush his 50 mile race with a top 10 finish. After the bench break I felt rested and energized to tackle the last part of the trail. I knew that a few hundred yards down the road I’d hit the dehydration wall again but it was time to press on. A half mile down the trail I saw a tiny creek. Water was tricking down and if you took on step you’d be past it. I wet my cap and bandana and loaded up my handheld water bottle with some of the precious liquid. It was more of a trickle of water than anything but it wasn’t murky or anything. Still, I would only use it to douse myself and didn’t drink from it. I wet my shoulders and back from the handheld and it felt glorious. At that point I knew that I would be alright and having that bottle of creek water made me feel abundant and shortly after that I was at the aid station. I found a chair in the shade and made that my home for a few minutes. The volunteers were awesome and I chatted with other runners. One guy, McKinley, was doing the 50 miler a week after doing the Boston Marathon. We had a good chat and laughed. 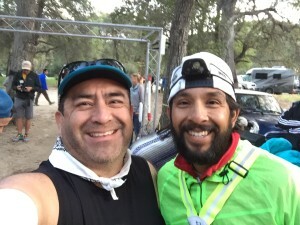 Another runner was doing the 50 miler race but was super happy to know he could drop down to the 50K. I got up to fill my bottles and saw my friend Adriana there. She was doing the 50K and this was also her last aid station before the final 3 miles. After I loaded up I told the volunteers that they brought me back from life and it was time to get this thing done. I took off down the trail and shortly thereafter ran into Steve who was driving a truck on the trail. There was a trail runner who was lying on the side of the trail with an ice pack. “I promise, I didn’t just run him over,” Steve joked to me. Steve had a couple of helpers already and they were good. Steve is an EMT so the runner was in good hands. I continued power hiking down the trail when my friend Christina passed by (she has a great trail running blog that I follow, “A Running Mess“) She was finishing up the 50K race and looked strong, moving much faster than I was at the time so she went on. Shortly afterwards a couple of Wild Mountain Running guys caught up to me and encouraged me to basically get the lead out and press on. I guess I looked fresh enough to give it more gas but they made their comments in Spanish and my brain wasn’t quick enough to give a good retort as they continued on. I thought I was moving plenty fast for someone who had just come back from being ready to quit. I could see the final road section up ahead when Steve pulled up in the truck and started joking that the AC was too high in their truck and it bothered him. A few moments later I heard some clicking noises behind me and it was none other than the runner who had been lying on the side of the road, powering on with trekking poles. “Hi there,” I said. “Aren’t you the guy that was down back there?” I asked a little perplexed. I sort of chuckled at the absurdity of our sport. I thought he was going to be driven to the finish line and instead he had a miraculous recovery and was motoring along with me. We got to the paved road, the last mile of the race. “Well, you were in good hands. Steve, the guy who was helping you, is an EMT and knows his stuff.” I told him. It turns out that the runner, Michael, had met Steve many years before across the country. We went on to chat about that story for a bit. We power hiked and ran some together. He was still in recovery mode so we didn’t run too much. I knew I was in last place by a bunch so didn’t have any nearby “targets” to try and pick off to get a better place. After a bit we ran into a group of three folks who were cheering us on and telling us to give it some gas, once again in Spanish. “I think we’re being taunted in Spanish,” Michael said. I think that as a Latino I am used that kind of stuff. 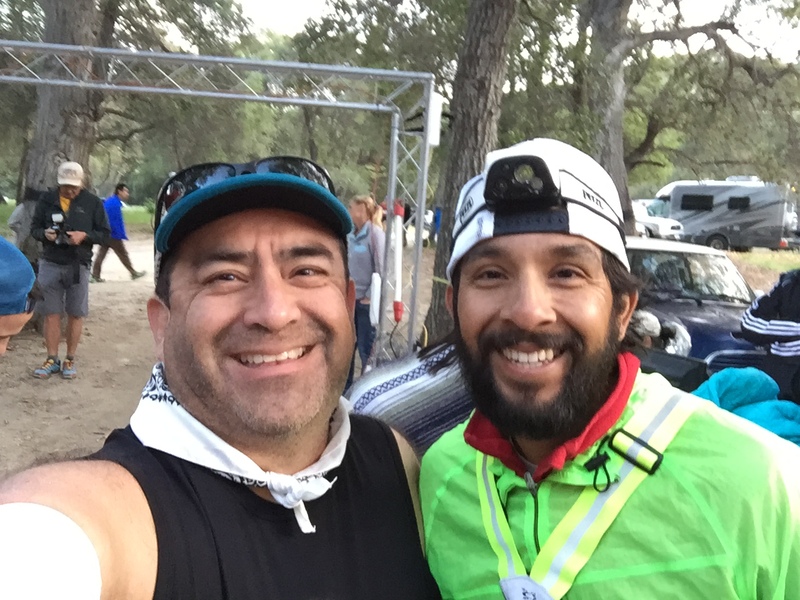 Remarks like that are usually inspiring and I feel that the person in being encouraging but there is definitely a macho aspect about those types of encouragements which I rarely hear from non-Latino runners. Although I did have an Anglo female aid station volunteer at the Sean O’Brien marathon race a couple of years ago who tried to get me on my way by saying that a woman had just left the aid station and was doing the same marathon race had just left. That didn’t light any kind of fire under me. I still stayed a bit and grabbed a cup of chicken soup before I did the last half of that race. Back to the Leona Divide race, I started running some and the little group cheered. One of the group peeled away and it was Michael’s lady friend and she was carrying a folding chair for him. We ran the rest of the way to the finish line and I was glad to be done. After crossing the finish line of the Leona Divide 30K race. After the race I was pretty spent. I leaned up against the side of the Green River Community center and gave myself a couple moments to recover. I wasn’t sore or anything. I had been dehydrated and that had thrown off the day. 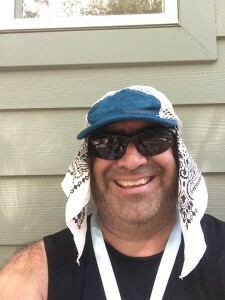 I didn’t have an appetite but I did grab a cup of beer then headed to my car to get my folding chair and cooler of soda so I could chill at the finish line and greet other friends as they came in. The car was parked much farther than I remembered and almost a mile later I had finally reached the car. It took me a few minutes with the AC blasting before I decided to just call it a day and head back. I saw Adriana doing the same long walk and gave her a ride to her car then made the drive home. I think it’s obvious that I need to carry way more water with me at future Leona Divide races. My legs still felt good at the end of the race but my vision was still jacked up and things were super bright. I don’t regret sharing water with people who needed it but I should have had at least a 2 liter pack with me. I also could have carried more real food and I should have taken some candy with me like red vines or gel blocks or something else that could give me some energy and wouldn’t make my stomach feel bad if I ate them without water. Of course I need to train more to avoid being on the trail for that long a time. I did finish DFL, narrowly missing the 30K SKT (Slowest Known Time). You can see my Strava activity here and please connect if you’re also on Strava. Here’s my video of the Leona Divide 30K race on YouTube. I dedicate this race to my friend and former colleague Sylvia Ramirez who passed away a week before the race. She worked with us at the union after she retired from working at the County of Ventura. I used to share my running stories with her and her son came out to run a couple of races that our union had helped sponsor. We had a lot of adventures together working on campaigns to help our workers and to get strong candidates elected into office. I miss her dearly. 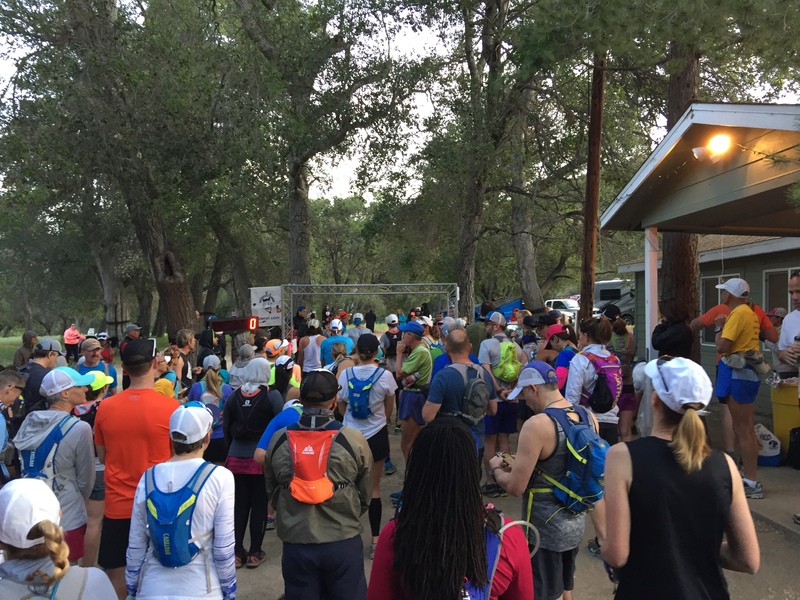 This entry was posted in Events, Training and tagged 2017, Lake Hughes, Leona Divide 50/50 30K, Race Start, Running, Trailrunning, Video. Bookmark the permalink.